Plants that are rarely seen in the everyday garden have the strongest hold on the imagination. With loud colors and large foliage, tropical plants are most commonly thought of as exotic plants. Although many exotic plants can be cultivated in the home garden, there are also many species that are better left in the wild or in botanical gardens. A member of the sundew family, the venus fly trap (Dionaea muscipula) is an herbaceous plant native only to North and South Carolina in the United States. The plant is carnivorous and supplements its diet by luring and attracting insect prey via an elaborate trapping mechanism. Beautiful and exotic in appearance, the venus fly trap is the most commonly cultivated carnivorous plant. The venus fly trap grows in USDA zones 6 to 8, though when cultivated at home, it should be grown in a terrarium to promote humidity. The venus fly trap does best with bright, indirect sunlight and a nutrient-poor potting mix of peat moss and sand. The plant needs to be watered frequently during the growing season, enough to keep the soil consistently moist. Venus fly traps should never be fed human food such as deli meat, and the plant can usually catch its own insects without human intervention. Purple beautyberry (Callicarpa dichotoma) is a shrub commonly cultivated as an exotic ornamental. The plant is notable not only for its rich green foliage and pink and lavender blooms, but for its clusters of brilliant purple berries. Purple beautyberry grows best in full sunlight or partial shade in USDA zones 5B to 8A. The shrub will tolerate a range of soil conditions, from acidic to neutral to alkaline, so long as the soil is well draining and moist. 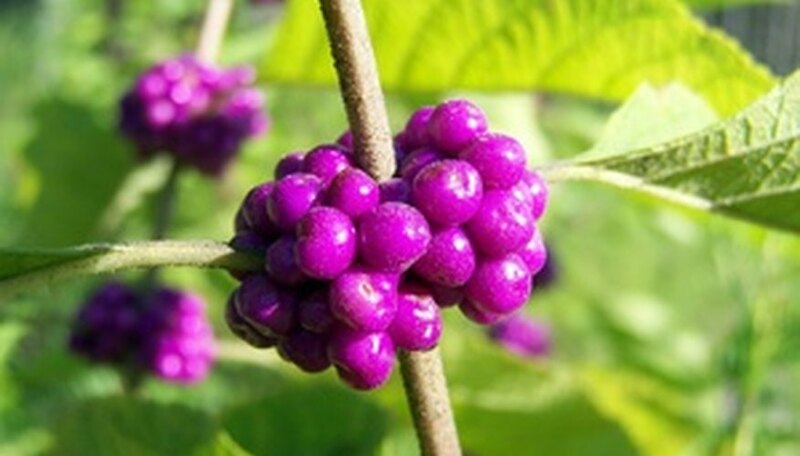 Purple beautyberry is typically pest free, is easy to grow and makes an excellent specimen plant in the center of the yard where its luminous berries can be admired. The voodoo lily (Amorphophallus spp. ), also called a snake lily, is a bizarre plant that boasts large flowers that smell like rotten meat in order to attract their primary pollinators (flies). The voodoo lily has a deep purple spathe accented by a waxy, protruding black spadix. The exotic plant, which can reach heights of up to 6 feet, is sure to be a conversation starter in any garden, especially with its wafting odor. The plant grows best in USDA zones 9 to 11, in full shade or dappled sunlight. The plant prefers a slightly acidic or slightly alkaline soil. Water the lily as needed. Are Camellias Poisonous to Dogs? Are Carolina Jasmine Flowers Toxic to Bees?